You have a choice of making your sofa look plain or printed. If you choose a printed fabric for the entire sofa it’s safer to select one from the designer catalogues. Otherwise, finally it could look like something totally different from what you had imagined. In line with the recent trend, there is also a mid-way approach of making your sofa partly printed. Prints and colors is a personal choice. However, its always advisable to choose dark colors if you have little children at home. Kids tend to drop food or wipe hands on the sofa leading to stains. Even dense patterns can help reduce the visiblity of a stain. In our case, we chose a dense pattern for the back rest and seating area and a light color to contrast the rest of the sofa. Such an arrangement also helps highlight the pattern used. Its like framing a painting. Also, its best to choose fabrics that are thick. They make the sofa last longer. Thinner fabrics yield easily to pressure over a period of time. Velvet fabrics attract more dust. Jute fabric has a great look and feel but is eventually very risky to use. If one fiber comes out from one side all other threads could yield. One thing is for sure, all materials present in hardware shops have great margins within mrp. It’s possible to get a good discount by picking it up yourself. I bought the foam sheets as well as the fabric from a Haryana Handloom shop. Good options in brands for foam sheets is Kurl On and Rest well. Cost of Labour was Rs 750/- per seat. The toughest part was deciding how many meters of cloth we would actually need. I had to make 3 trips to the fabric shop due to the extreme amount of confusion. I guess its always better to buy the cloth and fix a carpenter from the same shop so there is no conflict in opinion. Good carpenters will manage to rip open the sofa in no time. You will soon be flooded with a 6-feet tall stack of dry waste. Save the big covers in which the foam sheets were bought. They will be helpful in managing the dry waste stacks. 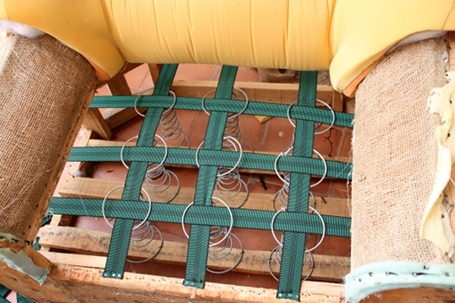 Once the sofa is opened completely, the springs are held in place by a mesh of elastic tape that the workman knits skillfully through the sofa springs. Measurements are taken of the sofa and the cloth will be taken away for stitching, only to be brought back the next day. Paranoid or suspicious people can number the cloth pieces before sending. The next day he will have to show the stitched pieces with the numbering in place (else he has asked for more cloth than he needed). The next day, after fixing the foam sheet the cloth will be nailed to the sides of the sofa structure. Ensure that the nails are not spaced too far apart as the cloth could then come out easily between the gaps. Once the cloth is nailed you can sit on the sofa and check its comfort. It’s also a good idea to use up left over cloth to dress the rest of the room. I have managed to make a runner on my TV table and a center piece on my coffee table. You can use your imagination to make table mats, table/music system covers, backdrops in photo frames, small tea coasters, etc. or like my husband you can suggest making a shirt out of the fabric and sitting on the same sofa. A 5-seater sofa set will mostly take 3 days to complete. It’s always better to buy the raw material yourself and monitor the work while its getting done. That way you will not only get rid of unnecessary middle-men margins but will also be sure of the quality you will get eventually. Ready-made sofa sets look brilliant but often don’t stand the test of time. Behind the lustrous fabric some of them hide poor quality material and craftsmanship. However, a 3 day effort can create a sturdy sofa that is reasonable as well. Only drawback here is that you can not change the design of your original sofa. Suppose you want removable back cushions or seats it’s not possible to do that. You can only change the fabric and the inner material used to give your sofa new life. It’s like new wine in a newly painted bottle, but the bottle is still the same. Good tips Roma. I’m considering upholstering of my sofa in next few months. Can you please send me the details of the shop where you bought the fabric and the person(s) you got to do the upholstery work. Thanks , Shalini. I sent you a mail regarding the same. Hope you received it. 2 questions – did your 3+1+1 sofa set take exactly 21 m fabric, or were there significant leftovers ? Do you have any idea of faux leather and/or velvet upholstery price? We did have about 2 m left over from 21. However, in our case the confusion was because we were planning to use two different fabrics. If you are using only one, you can go ahead with lesser. Just saw this.. a really informative article. I’ve a 3+1+1 sofa set that I purchased cheap. Would like to extend it’s life by 2-3 years by changing the upholstery and foam. This is the old Indian sofa with exposed wooden armrests, wooden back, wooden legs and upholstery required for the back and seating area. You think with your expertise that it’s possible that I can get this done in 5-6k? Off course I’m just asking for an informed opinion and not an exact estimate. More importantly, are there any tips you might have for someone in my situation? Thanks a ton.. in advance.. I think you can get it done in 6k or so. You can contact any haryana handloom emporium. They have contacts of people who change the fabric. That way it will also work out a bit cheaper for you. Besides, you will not have to boggle your mind with questions like how much cloth is required. It will be settled between the emporium guy and the sofa maker with some supervision from you. Hi, Really useful article. Could you please send me the details of the shop where you bought the fabric and foam? I unfortunately dont have any contact details. I do remember it is called Haryana Handloom and is in Hanumanthanagar, Bangalore. Yes, sure. It’s a good idea. The sofa work was completed last month. Thanks to your advice got the thing reupholstered, refoamed (part of it) and polished in around 6k (with some wood work as well). Had a lot of fun selecting the upholstery material too. If it wasn’t for your blog i would have gone ahead with the 10-15k estimates i was getting. Thanks nice to know, George. Enjoy your new sofa! I am in same situation as you were sometime back. I have a wooden sofa set and looking for upholstery for back and seating area. Can you guide me on how you went about this? Where did you shop and how long did the complete process take? I had reupholstering, partial foam replacement and repainting of the wood done. The entire labor cost was close to 4k, foam cost under 1k, upholstery cost around 1.5k. 1) call a few carpenters and get quotes. A lot of them will be exorbitant. 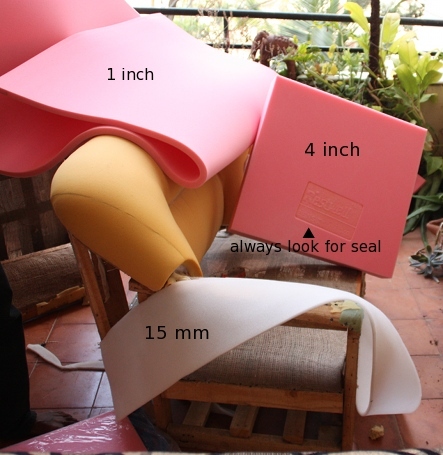 2) make sure you understand how many meters of cloth would be required, how many sheets of foam etc. 4) buy your own material.In my case since I needed close to 7m cloth only, when I went upholstery hunting in Mumbai, I found a store willing to give me material at half-price as it was the end if the roll. Always buy a meter extra just in case. 5) it was really tough finding a carpenter to do a low cost work like this. Lot of them aren’t interested in any work that bills less than 15k. Thanks for the details. Where in Mumbai did you get the foam? Please share. The shops near my area are charging exorbitant amount. The shops were in Crawford market. Also in my case I needed just 7 meters and I got lucky because I was able to get the leftover fabric at the store at nearly half the price. do you have ocntact details for the person who did it for you? Sorry Ajit. Sadly I dont. Hi, Just saw this article accidentally. It is exactly what I’ve been looking for. Would you mind sharing the details of where you found the people to do your re-upholstery work? I am looking to re upholster (just change the cover) my recliner sofas and searching in vain for the right people…currently, the quote is coming to 30+k!. Thanks in advance! I dont have the contact of the person. However, you can try at any Haryana Handloom Shop. Alternately, you can enquire at the furnishing stores on commercial street. They all have tie-ups with people who change the upholstery. 30+ k is on the higher side. Haryana Handloom stores can give you a better price. Yes, I think it is right. Hi, Sorry I dont remember. 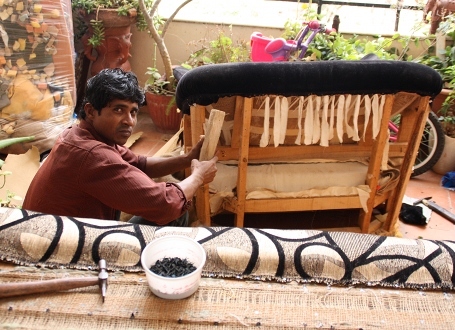 I stay in Bangalore near Indiranagar and would want to change the fabric of my sofa (3+2). Could you please suggest someone who can do this. hi i owned a furniture store so article like yours is of very use for me.though craftsmen do have ideas but it is always better to have good knowledge as a owner so that i can bring good ideas in to work.in this regard i would like to request you that please give some photoes of your sofa when it was not covered by cloth.if i could see it wooden frame that would be great help for me. there seems to be two extra cushion on each sofa handle.how are they have been attached to the handle, with the help of some special things like adhesives or it has been stitched to it? where can i find a dealer in BANGALORE. We have old style sofa with arms and top and legs not covered with upholstery. It’s 3+1+1. Will it be possible to change the style, cover entire sofa with upholstery now. Reason I am want this is to save money on new sofa + it is made up of solid material and we don’t want to replace it. I am planning to make new sofa for my home at Ahmedabd. Do you know materials shop and laborus for it. It would be very helpful for me. Thanks for helping the people. So sorry I dont have contacts in Ahmedabad. I too went through a few trips back and forth to redo our sofa, except we ended with a disaster. Would you recommend these carpenters? If so please pass on the contact details. When we got our sofa done, the workers were so rough taking apart the sofa that it pretty much collapsed within a few months. I’m wondering if we should attempt to revive it or just buy a new one. Also,where did you buy the jute material I need some too…except it’s for a craft project. I mailed you the contact of a person who does it. Its better to choose a carpenter who is recommended by someone otherwise the finished product could be a surprise. I bought the jute material from Haryana Handloom. They are there all over Bangalore. 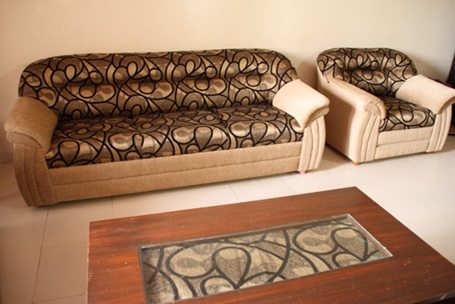 hi Roma , I am from Bangalore, and I need to get my traditional sofa(it called maharaja type I guess) reupholstered, I called two people, one guy has quoted 13500 and anpther said the cost can go upto 25000, I am not ready to spend that big amount at this point of time, can you please give the contact details of the person who did it for you. Hi, I mailed it to you. Mailed it to you. Thanks. Hi Roma , I am planning to change my leather sofa to fabric one.plzz suggest some persons contact where I can get it done. Thanks for the very informative article. It will be helpful for a lot of persons, in all parts of the Country, not just Bengaluru. Would you have any recommendation in Whitetield, Bangalore pl? Sorry, dont know anyone there. Hi, mailed you a contact. So sorry, dont have carpenter contacts. Thanks for the work you are doing. Can you please share the details of the person for sofa repair. Also would like to know, if you received any warranty on the foam you bought? Hi , Sorry dont know anyone in New Delhi. 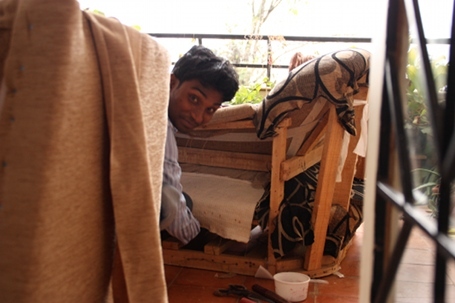 Hi, Im in Bangalore and I would like to refurbish my sofa. Please share the contact details. your article was very informative. I have a classic wooden and upholstered sofa set ie, 3 seater and 2 single seaters, the frame is teak, with upholstered back outer and inner, outer and inner sides, and seat. the set is now 8 years old and in good condition except for the cushioning and the upholstery which is looking a little old now. plan to refurbish it and figure that I would have to redo the foam and fabric. please let me know approx. fabric I wld require and most importantly, the thickness of the foam. I would prefer a firm seating, not the soft type. also, please guide me as to where I can get the work done. Helpful…. I have a traditional 3+1+1 sofa set . Plan to chhange seat cusion 40denstiy and back 32 density. Please search for zeegreen. Thanks. Sorry Sanjeev, I dont know anyone for this job. Hi Medha, you can chose a wash-friendly fabric at one of the Haryana handloom shops. Avoid velvet, rough jute, leather, etc. very informative……..went through many posts but your post was very close to what my queries were. Thank you. 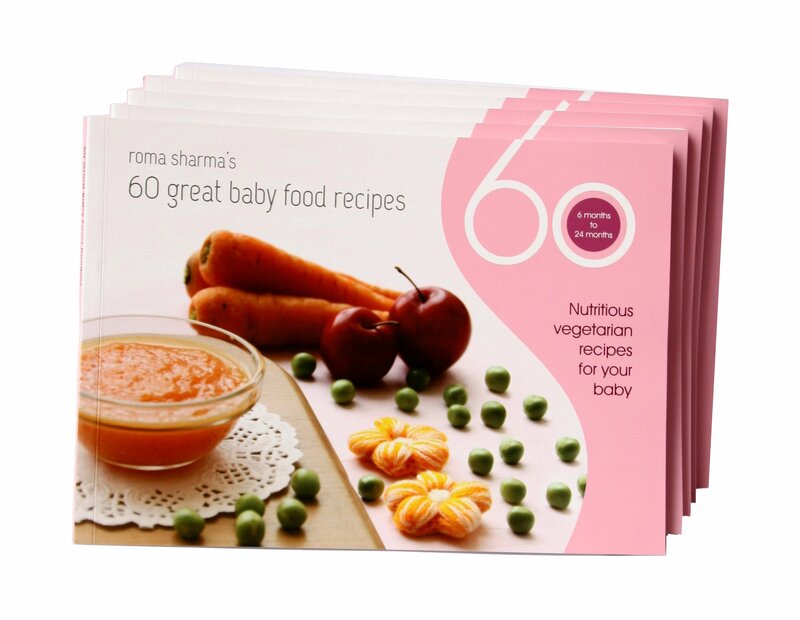 Regards, Kamal Barua, New Delhi.